For formal occasions, you will receive an invitation, which you should always reply to, even if only with a quick phone call. Your invitation should specify if “plus ones” or children are allowed, but it’s OK to check with the host if it’s not specified. Don’t just bring them and hope it’ll be OK. Do take a gift with you for the host or hostess, such as a bottle of wine, but don’t be offended if it’s not used during your meal. The host has probably set out their menu well in advance. For a rectangular table, the host or hostess takes the seat at the narrow end of the table, and if their partner or co-host is there, they take the opposite end. The guest of honour sits to the host’s right. The host may say grace, or offer some sort of religious blessing. If you’re not comfortable joining in, it’s good manners to sit silently and observe. Some hosts may raise a glass to toast a guest, which you should join in with. Clinking your glass with another guest’s is not necessary. Always remove them from the table and place them on your lap. If you leave the table to use the bathroom, the napkin can be left on your chair. 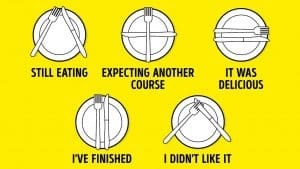 When your meal is finished, the napkin goes back on the table, on the left side of your plate. Don’t pick up your cutlery until everyone has been served. If there’s more than one set of knives and forks, you start from the set on the outside, and work in, towards the plate. During the meal, if you need to stop eating temporarily, point your knife and fork into the centre of your plate, crossing over at the tines of the fork. When you’ve finished eating, the knife and fork sit parallel to each other, with the handles pointing to about 4 o’clock. It’s good manners to pass the serving bowl anti-clockwise, unless a person across the table has specifically asked for it. If you’re passing a loaf of bread, cut yourself a few slices (Ideally without touching the bread) which can be shared with the person on your left, before passing the loaf on. Your bread plate should be on your left. Once the meal is finished, what happens depends on your venue. At a restaurant or formal venue, there will be staff to take away plates. At somewhere more casual, it’s down to the host or hostess to clear away, although it’s fine for one or two of the guests to help. Traditionally, the signal that the meal is over is for the host or hostess to place their napkin on the table, stand, and suggest everyone leaves the table for coffee in another room. While you should always thank your host or hostess as you leave, formal events call for a written thank you note, simply thanking them for the meal, and noting something you particularly enjoyed. This should be sent within a couple of days of the event. There are plenty of other common sense rules, which are probably obvious, such as turning off your mobile phone before the meal begins, keeping elbows off the table, and not talking with food in your mouth. Now you’re ready to sit down at even the finest restaurant and enjoy your meal like a true society maven. If you didn’t get your invitation to Harry and Meghan’s big day, we’re sure you’ll find somewhere to put your skills into action, and it could well be one of the many restaurants which Banksford supply! ← Can you ever purge single use plastic?